I have been frequently asked over many years how I do astrophotography. This article will attempt to answer that question. But first a disclaimer: I am not a "serious" astrophotographer. I just "play" at doing astrophotography. 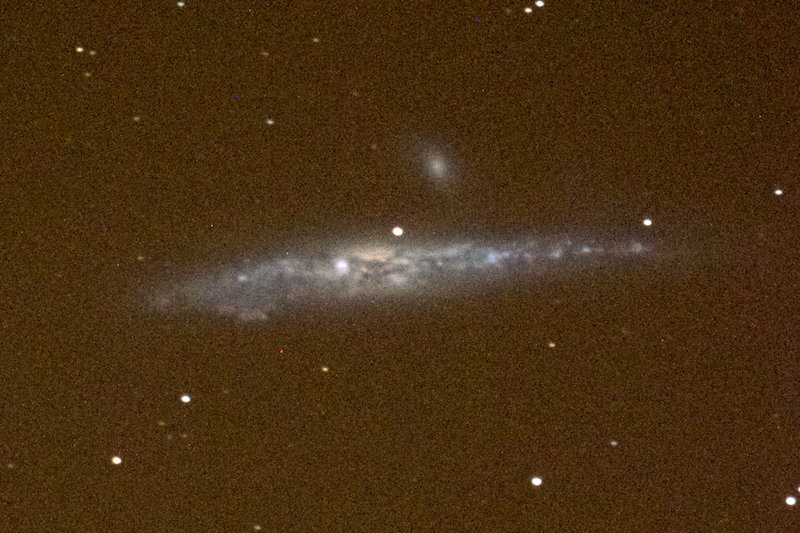 I do enjoy the challenge of manual long duration guiding to acquire images of Deep Space Objects (DSOs). I don't generally "stack" DSO images, but I will occasionally stack frames from video recordings of planets or moon craters. I don't have a dedicated astro imager and I don't normally use my Macintosh computer at the telescope. 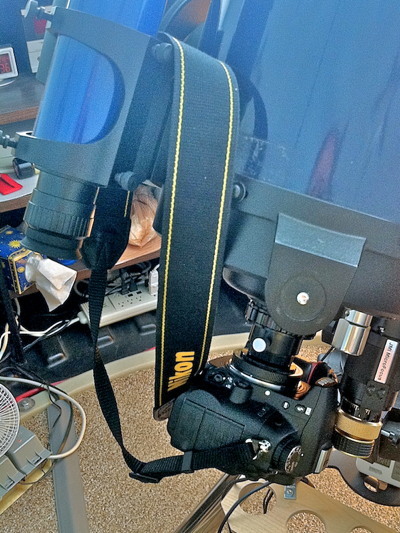 I usually use a Nikon D7000 DSLR on the Meade 8" LX200-ACF telescope. Occasionally I will use an iPhone 4. Sometimes I use one of my other telescopes (Meade ETX-70AT, ETX-105PE, ETX-125AT, or Edmund 3" Newtonian) for imaging. In this article, I will discuss how I set up for astrophotography with the telescope, camera settings I use, how I focus and guide during long duration imaging, and how I process the images for posting on the "Cassiopeia Observatory" reports and Photos albums. I'll discuss both the D7000 DSLR and the iPhone, where appropriate. While some of what I'll discuss here will be specific to those cameras, much of the article will be applicable to almost any DSLR or point-and-shoot (or cell phone) camera. I won't be discussing using CCDs or other dedicated astro imagers in this article, although some of the techniques I discuss may be applicable. There are several types of astrophotography: sky, piggyback, prime focus, afocal, and eyepiece projection. My earlier article on "Astrophotography Types" discusses each of these and provides some general imaging and editing tips. I won't be discussing sky astrophotography specifically here but the image processing techniques discussed later can apply to all types of astrophotography, regardless of the type or camera used. Where appropriate, I'll include links to other articles or reviews I have written. Be certain to check those out for additional details. If you are new to astrophotography, I suggest using the moon as your first imaging target. This will allow you to get to know how to use your telescope + camera combination for astrophotography. Once you are getting good photos of the moon and craters, you can move on to more difficult targets. Imaging the brighter planets is easy; getting details on those planets is difficult. (This is where imaging stacking may really improve the quality of the image.) Once you have some experience with imaging bright objects, and if your equipment allows, you can move on to imaging stars and DSOs. Stars and bright DSOs (like M42 in Orion) are easy. 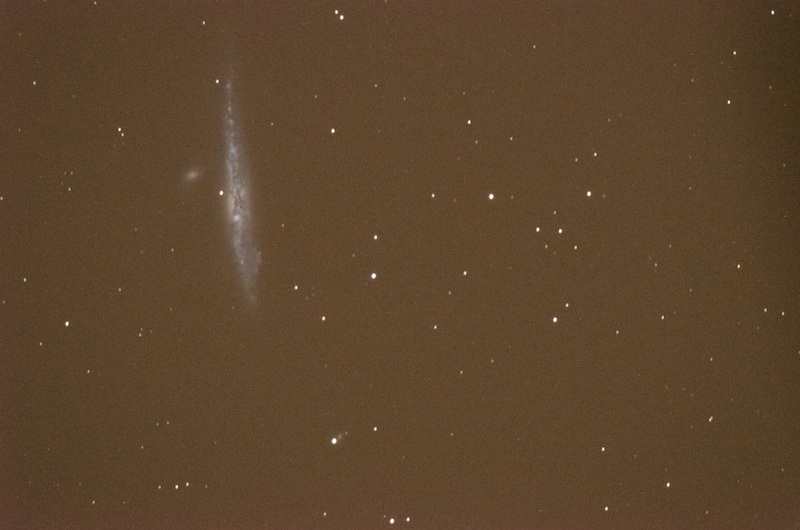 Faint nebulae and galaxies are challenging and will require some dedication. In this document I discuss using a Nikon D7000 DSLR. I upgraded to a D7200 DSLR in April 2015, but the techniques discussed here remain the same. I am also currently using an iPhone 5s in place of the iPhone 4 discussed here. In the "Image Processing" section further down this page I discuss using Apple Aperture for my initial editing of astrophotographs. As Apple has ended development of Aperture, I made the switch to Adobe Lightroom for photo management and initial editing. The editing concepts discussed in the "Image Processing" section remain essentially the same regardless of the editing software used. In 2016 I upgraded from the 8" LX200-ACF described below to a 12" LX600 with the StarLock autoguider. Consequently, I no longer do handguided imaging using the Off-Axis Guider. iPhone astrophotography is now done with an iPhone 6s Plus. Sky astrophotography with the D7200 DSLR and the iPhone is typically done using an iOptron SkyTracker Pro. I now mount the iPhone for afocal imaging using a Levenhuk Smartphone Adapter. I now use an iPhone 8 Plus and a Nikon D850 DSLR for astrophotography. 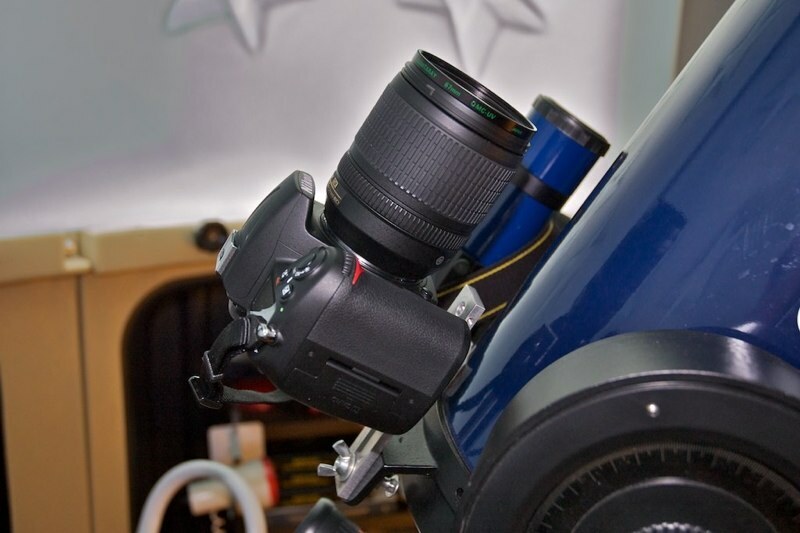 How a camera is mounted on the telescope will depend on the object to be imaged, the telescope's capabilities, and the camera used. The options include: piggyback, prime focus with an Off-Axis Guider (OAG), prime focus using a star diagonal or a visual back, eyepiece (afocal or eyepiece projection), with or without a focal reducer or Barlow Lens. Some of these options can be combined and some not, depending on what accessories you have and their design. 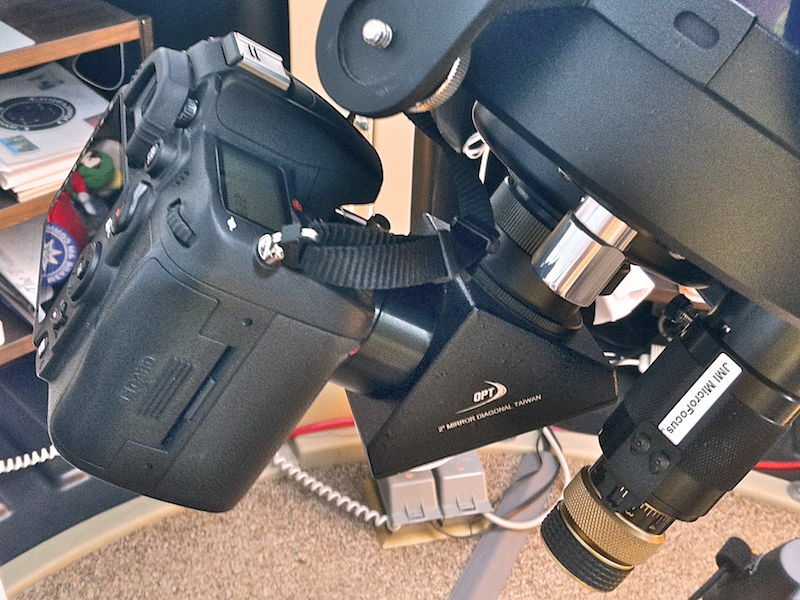 I will discuss the accessories I use; for some other astrophotography accessories, see the Accessory Reviews: Astrophotography page on my ETX Site. In order to decide which mounting method to use, you first consider the object that you want to image. Is it bright or is it faint? Is it large or small? Do you want a wide-field view or a high magnification view? While considering these options, you also have to consider the limitations of your telescope + camera combination. 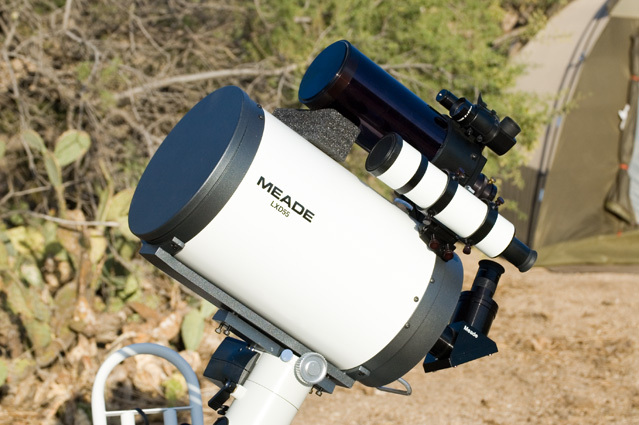 If you don't have an OAG, then you will be limited to short exposures, typically less than 1-2 minutes, depending on magnification, unless you have an auto-guider using a separate guide telescope. I'll discuss my thinking and my options. I then use my Meade 12mm illuminated reticle eyepiece with Rigel Systems PulsGuide illuminator to manually make guiding corrections (if required) using a bright star. If the DSO is really faint and/or if it is larger than the normal prime focus field-of-view (FOV), I will add my Antares focal reducer to make the system optically "faster" and reduce the image scale. but I don't use that configuration with my 8" LX200-ACF. For the moon, sun (with a solar filter attached to the telescope), and planets, I typically mount the D7000 at prime focus (visual back or star diagonal). If I need less magnification to capture a full disk image of the moon or sun, I'll add the focal reducer. If I need more magnification, I'll either use a Meade 2X Barlow Lens or 3X TeleXtender. I have used the 2X Barlow Lens and 3X TeleXtender on bright planetary nebulae. For even more magnification on the moon, sun, or planets, I do eyepiece projection using my OPT Camera Adapter with a 9mm eyepiece, with or without the 2X Barlow Lens or 3X TeleXtender. As with visual use, there is a magnification limit for all telescopes, typically twice the diameter of the telescope's aperture in millimeters. For my 8" (200mm) telescope, that means about 400X is the theoretical maximum magnification. On nights of good seeing with bright objects, it is possible to exceed that maximum, sometimes a lot and sometimes just a little. That way, if the holder screw loosens, the camera won't fall to the floor. A new model of the iPhone adapter is now available from Orion Telescopes & Binoculars as the "Orion SteadyPix Telescope Photo Adapter for iPhone". If you are using a point-and-shoot camera with a non-removable lens, you will need an afocal adapter to hold it securely on an eyepiece. See the Accessory Reviews: Astrophotography page on my ETX Site for some examples. But if you have a steady hand, you can hand-hold a camera over an eyepiece and by aiming the lens at the eyepiece, you can image bright objects. Once the camera is mounted, you have the challenge of getting the object in focus. If the object is bright, like the moon, sun (through a safe solar filter), or planets, focusing can be done by looking at the object in the DSLR viewfinder, a "live view" on the camera's display (if it provides that), or on the cell camera screen. 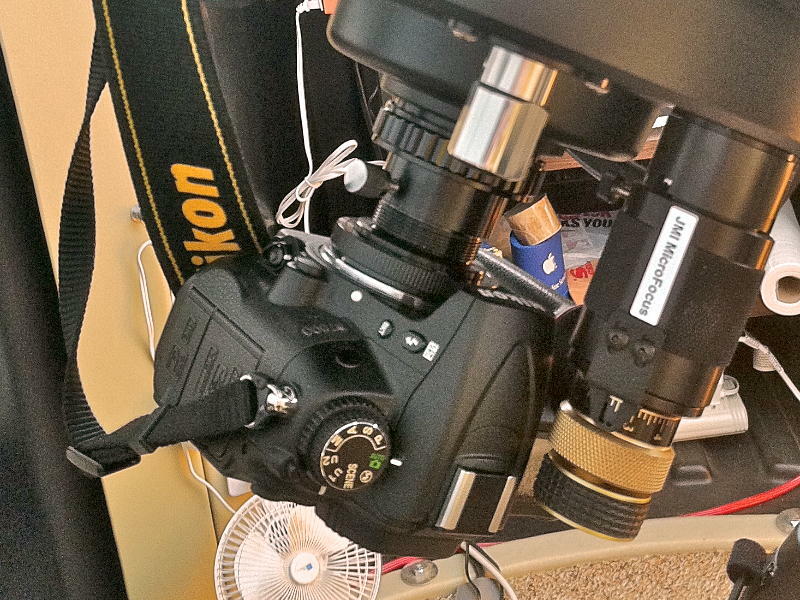 When doing afocal astrophotography, focusing the object with your eye before mounting the camera is also effective. For afocal imaging, the camera lens must be focused at "infinity". With some point-and-shoot cameras, as well as some cell phone cameras, zooming in or using a "macro" setting can help. A mask can also be used with fixed lens digital cameras; you just need to make small focus adjustments and then check the resulting image for proper focus. Repeat until the mask image is correct. Using fixed lens film cameras with a mask is more difficult since you have to take several photos and process the film to see which image was in-focus. See the linked review for more on how this focusing aid is used. 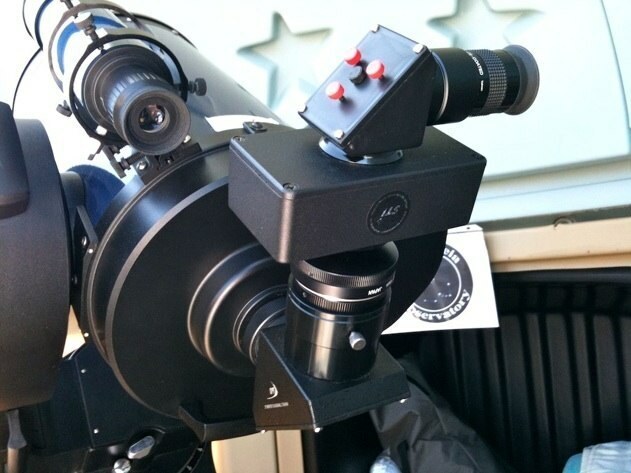 For telescopes that have it, once you have achieved a precise focus, you should lock the focus position in place to prevent the mirror or focuser position from changing as the telescope is slewed from your focus target to your imaging target(s). However, just locking the focus may not be sufficient if you do a lot of imaging over a long night. As the temperature changes, so does the focus position. A few degrees won't matter much, but if you focus shortly after sunset and then do more imaging around midnight, you will certainly want to refocus for those later images. If your telescope does not have "focus lock", then try to focus on a star near your intended imaging target to avoid shifts in optical components as the telescope orientation changes from one object to the next. Occasionally, filters will be attached to an eyepiece or elsewhere in the optical path. Doing so may or may not change the focus position. So check before imaging. Of course, with digital cameras, checking images is easy by using the camera's screen (if it has one). However, don't rely on that small screen to show you a very slightly out-of-focus image. Many times I have thought an image was in-focus, only to discover that once the image file was viewed on a computer screen, it was obviously out-of-focus. One other point about focusing. If you use an Off-Axis Guider, you need to be certain the guiding eyepiece is focused at the same position as the camera. Using a parfocal ring, you can adjust how far the eyepiece inserts. Focus the camera as described above for the OAG and then slide the eyepiece into the OAG eyepiece holder. Adjust the parfocal ring on the eyepiece tube until the stars in the eyepiece are in focus, then lock the ring in place on the eyepiece tube. The next time you insert the eyepiece into the OAG, it will be at the same focus position as your camera. 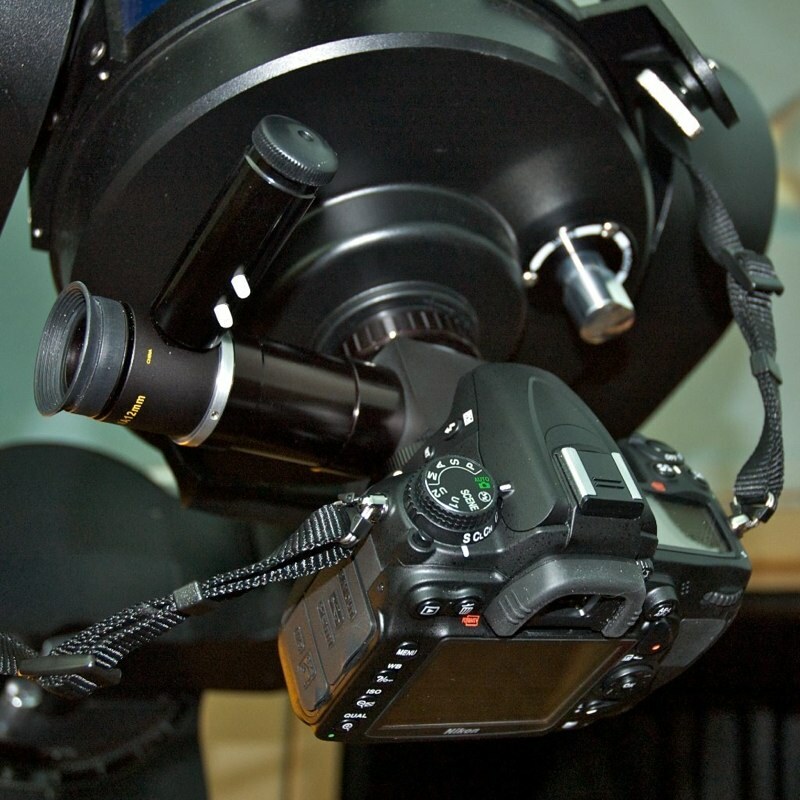 With the camera mounted on the telescope and the image in focus, actually capturing a usable image will require adjusting some settings on the camera. Of course, point-and-shoot and cell phone cameras may have very limited options for exposure settings. "Auto" settings may work for bright objects like the moon and brighter planets, so give them a try. If you find that the object is being overexposed in "Auto" mode, add a moon filter (and/or other filters). For faint objects, "manual" settings are a must. Trial-and-error with your specific telescope and camera will likely be required. I'll discuss what I do as a starting point for your imaging. You should make adjustments as needed. For bright objects, like a full moon, I usually use an ISO setting on my D7000 DSLR in the range of 100-500. This allows for short exposures to reduce the affect of atmospheric turbulence. Shutter speeds of at least 1/200sec are best. As the moon phase changes and I want to capture shadows along the terminator, higher ISO values are required to keep the shutter speed fast. ISO 1600 or even higher may be required at times. For planets, a lot of experimentation may be required. The planet's magnitude will determine what settings are required. High ISO values and fast shutter speeds are usually required to capture any details. Planet astrophotography can benefit from using a video recording. You can stack the video frames (discussed in the Image Processing section below) or you can review the video recording and find the sharpest single video frame. DSO astrophotography is the most challenging, both to your camera and to you as the astrophotographer. Shutter speed is not a concern; the shutter is left open for seconds or minutes. The D7000 DSLR can do timed exposures up to 30 seconds. For longer exposures, using the "Bulb" setting to leave the shutter open is necessary. I usually use ISO 6400, but sometimes higher or lower, depending on the object brightness. Exposures will vary from 30 seconds (for bright planetary nebulae) to 1, 2, 3, 5, 10, or even 15 minutes for very faint objects. There is always the tradeoff of exposure length, ISO sensitivity, image noise, tracking/guiding accuracy, and object brightness. I set my D7000 DSLR for raw image format at the largest dimensions available (4928 × 3264 pixels). The raw format provides the most flexibility during post-processing and the largest image dimension provides the most resolution in case I need to crop the image from the full-size frame. Raw images will be large files, 16 MB each for the D7000 DSLR, so you will need enough storage space on the camera to handle multiple raw images. And of course, your computer will need to be handle large image files as well. If your camera does not have raw capability or you do not have image processing software that can handle raw images from your camera, use JPEG at the highest quality (minimum compression) setting. When doing video recordings, the files can be quite large, taking tens to hundreds of megabytes each, depending on the length of the recording and image dimensions. Lastly, I disable Noise Reduction in-camera for the D7000 DSLR. I prefer to do noise reduction in software. 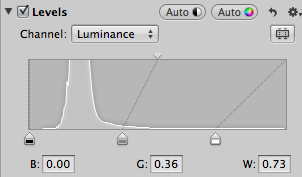 Another consideration of in-camera noise reduction is that it doubles the length of the "exposure". For example, if the image exposure is 2 minutes, the camera will do another "dark frame" exposure of 2 minutes, for a total of 4 minutes exposure. If the exposure is 5 minutes, you have to wait 10 minutes to get of the camera back. For a 10 minute exposure, you have to wait 20 minutes. Another alternative is to take your own "dark frames" and use them during post-processing on your computer. Since I "play" at astrophotography, that is more work than I typically want to do! Most cell phone cameras don't provide for exposure settings, so you are stuck with auto-exposure. Some smartphones may have apps that allow a little more control over the exposure. I have used NightCap, True NightVision, Slow Shutter, and Slow Shutter Cam on my iPhone for some types of DSO astrophotography. You can read my reviews on the Accessory Reviews: Software page on my ETX Site. 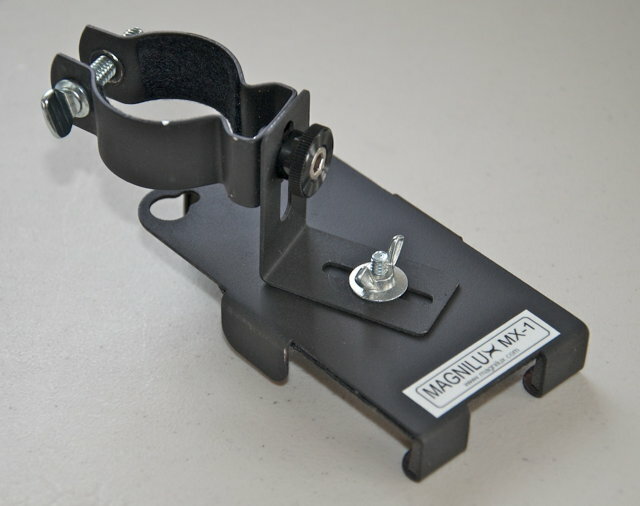 Mount stability is a consideration when doing astrophotography, especially with DSLR cameras, although it is important with any camera that has a mechnical moving mirror and/or shutter. Avoiding vibrations in the telescope at the start and end of the exposure are required. You should avoid actually touching the camera to start and end the exposure, which can induce vibrations. Using a camera's self-timer can help to start the exposure without vibrations. Or you can use a remote shutter release. I use the Nikon ML-L3 wireless remote with my D7000 DSLR. For my iPhone 4, I sometimes use the included earbuds as a remote shutter release, a feature of the Camera app in iOS 5. Many DSLRs have programmable shutter release accessories available, allowing hands-free exposure times of several minutes. (I don't have one of these, yet.) An important feature of many DSLRs is "mirror lockup". The D7000 DSLR has this and I use it to avoid vibrations from being induced by the mirror movement at the start and end of the exposure. Another technique to avoid vibrations is to use the "Hat Trick" method. See my linked article for more details, but basically you cover the telescope aperture, open the camera shutter, wait a few seconds for any vibrations to dampen out, uncover the telescope aperture for the duration of the exposure, re-cover the aperture, and finally close the camera shutter. Although not specific to camera settings, using AC power to the camera for long duration astrophotography can be a plus. I use an AC adapter with my D7000 DSLR, and if your camera has this capability, I highly recommend it. Besides saving on batteries if you use non-rechargeable batteries, you won't have to worry about depleting battery power during the exposure. Before getting into the specifics of guiding during a long exposure, some important things to consider when thinking about doing astrophotography. I mounted a 35mm film camera piggyback on the telescope and manually guided on a star to image the constellation of Orion for 15 minutes (on a cold winter night in southern Indiana). Polar mounted telescopes (GEM or wedge) will not have this field rotation problem when the mount is properly polar aligned. For best results, the mount should be "drift aligned". I use this technique to ensure good polar alignment of my wedge mounted 8" LX200-ACF. 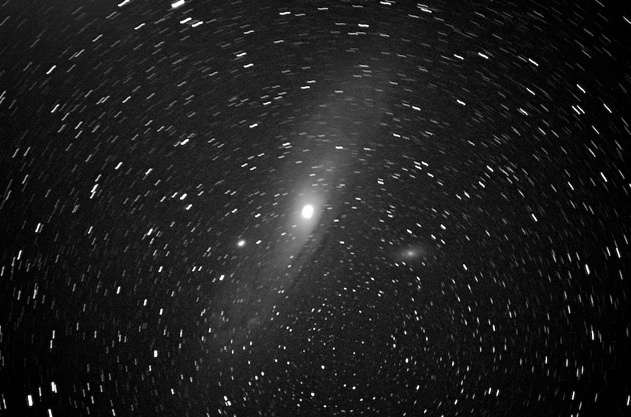 Telescopes which do have motorized drives, at least in Right Ascension, are more easily used for astrophotography. Without a drive, keeping an object centered as you fiddle with a camera is a constant battle. With a drive, even imaging the moon and brighter planets is easier since you don't have to keep moving the telescope by hand as you take multiple images. And for faint DSOs, a tracking drive is really required. Before you can begin tracking, and possibly manually guiding, on your target object, you have to find and center the object in the camera's FOV. This is easy for bright objects when using a DSLR or camera with a "live view". However, faint objects or any object when using a camera without a live view are difficult to center in the FOV. A good GOTO system will help. 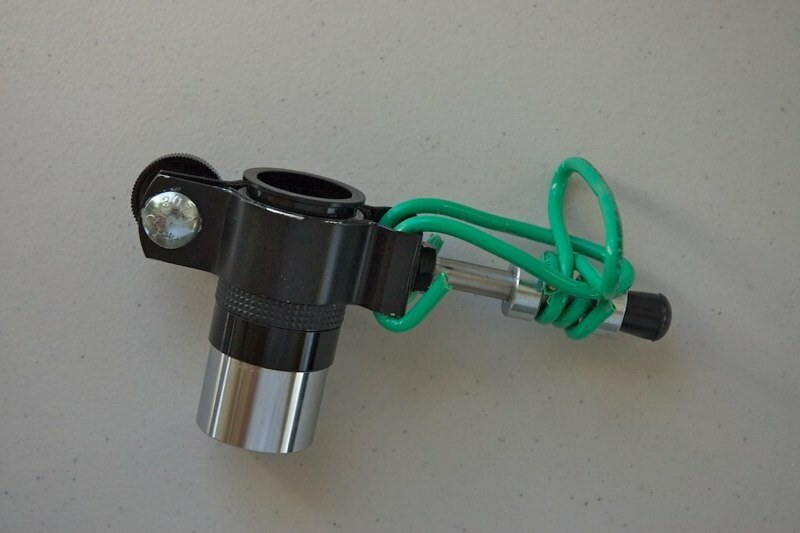 If you don't have a GOTO telescope, then you will need a properly aligned high power finderscope. No matter which you use, you may still find that doing "framing exposures" is required. If I can not see the target object in the camera's viewfinder due to its faintness, I will usually SYNC the AutoStar (the telescope's GOTO computer) on a nearby bright star or DSO, or even on the DSO itself as viewed through an eyepiece. I will then slew to the focus star (when required) and then back to the object. I will then take (usually) a 1 minute ISO 6400 framing test exposure and check the resulting image on the D7000 screen to see if the object is visible, and if so, whether the framing is good. I repeat the framing test exposure until I get good framing. While I'm working on getting good object framing, I m also looking in the illuminated reticle eyepiece on the OAG for a suitable guidestar. The OAG "picks off" a small portion of the FOV and sends the light to the eyepiece. This restricted FOV of the eyepiece means that actually finding a suitable guidestar can be a significant challenge when using an OAG. Sometimes I have to accept a less than desirable object framing to find a usable guidestar. Stars that can be easily seen in the reticle eyepiece are the best ones for guiding. But sometimes, the only stars visible in the eyepiece are faint ones, sometimes requiring the use of averted vision to keep it in sight. Faint stars may require that the star NOT be centered inside the crosshairs of the reticle, but instead positioned in a corner of the crosshairs. Very faint guide stars may need to be positioned a short distance from the crosshairs and then the same distance maintained during the guiding. Keeping a faint star in sight for 5, 10, or even 15 minutes can be difficult, but I find it an enjoyable activity, especially when the resulting image turns out good. If I can not find a suitable guidestar, it will be necessary to rotate the OAG to change the FOV, hopefully bringing a guidestar into view. Unfortunately, the OAG I use does not have a rotation capability; it has to be loosened from the telescope, rotated, and then re-tightened. That process can affect the focus, requiring a new focus test. I repeat this until I locate a good guidestar. The actual process of making guiding corrections is simple if you have a handcontroller for the telescope that has very slow slew speeds available. With the AutoStar, I use the slowest speed available, called "Guide". Before starting the exposure, I check which handcontroller slew arrow key moves the star in which direction in the reticle eyepiece. During the exposure, I monitor the guide star in the reticle eyepiece. If a position correction is required, I make it by briefly pressing the proper slew arrow key. I try to keep the corrections short, meaning that I try to avoid having the star drift too far away from its initial position in the reticle eyepiece. Most times I am successful, but sometimes not. 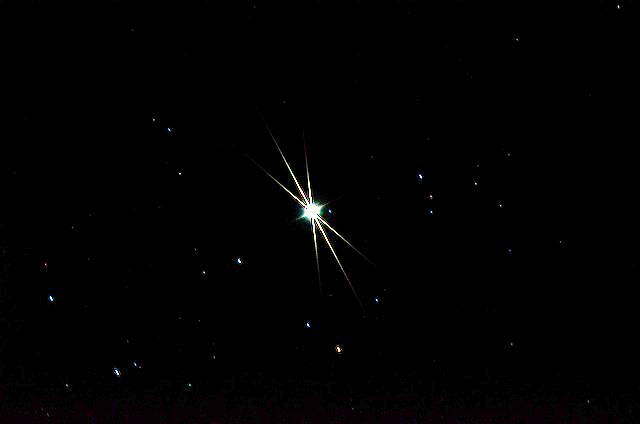 The star may have been too faint to continuously monitor, or it may have drifted behind one of the illuminated reticle lines and disappeared. (The blinking illumination provided by the Rigel PulsGuide really comes in handy when using faint guide stars.) If I lose sight of the star and can't immediately get it back into position, I will end the exposure and start over, picking a new guidestar and even repeating the framing test exposure, when necessary. Good manual guiding corrections during long exposures can make the difference in what is imaged. Small details in nebulae or galaxies can be blurred out by very small tracking errors. These details will be visible with accurate guiding. 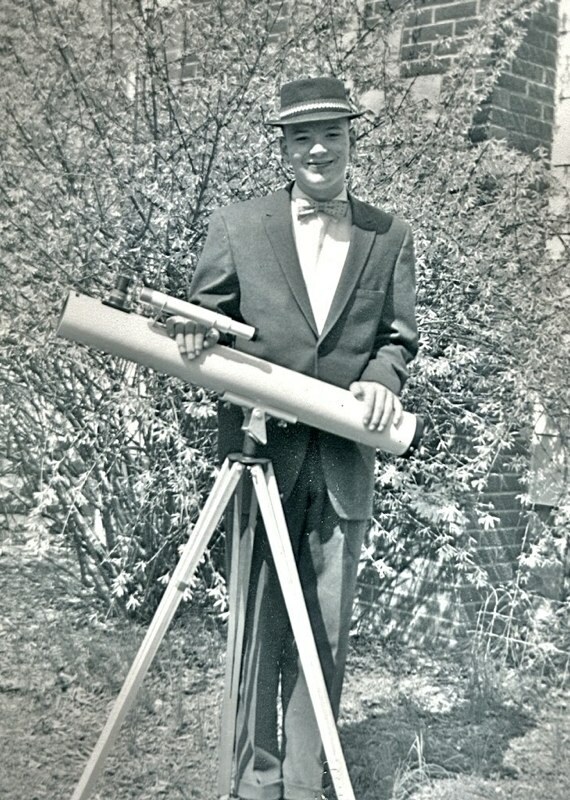 Watching a faint (or even a bright) guidestar in an eyepiece for several minutes can be tiring if you are standing and hunched over the eyepiece. Get comfortable and use a chair or stool if possible. 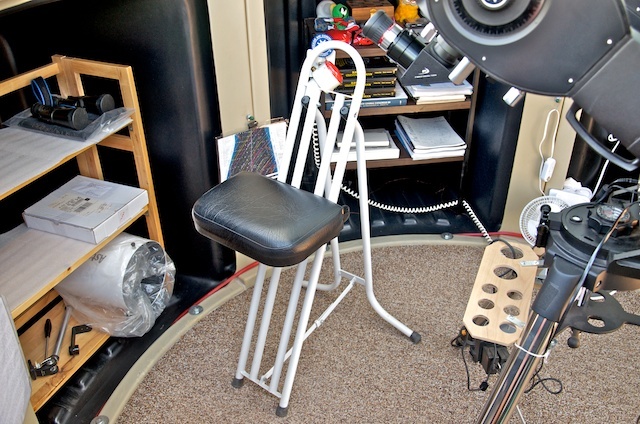 I have used a Starbound Observing Chair for many years. And don't stare at the guidestar; look away and even take short breaks from the eyepiece. Look up at the sky for a few seconds to refocus your eyes. Ideally, your imaging target will be well up into the sky, at least 20-30 degrees above the horizon. If the object is too low, atmospheric turbulence will cause your guidestar to dance around in the eyepiece, creating guiding difficulties. And if the star in the eyepiece is moving around, so are the stars that the camera is imaging, blurring out details. Poor seeing, whether due to low altitude in the sky or weather conditions, will affect guiding and imaging. Try to image when seeing is good. Of course, sometimes you have no choice but to image objects low in the sky or during periods of poor seeing. If that is the case, do your best and hope for the best. Some telescopes provide a "Periodic Error Correction" (or PEC) capability. 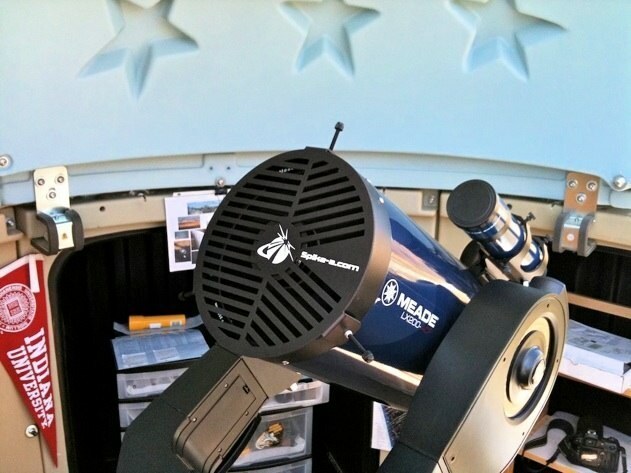 Once configured for a specific telescope, this provides more accurate tracking, reducing (but not necessarily eliminating) the need for making manual guiding corrections. Since I have an OAG and do manual guiding corrections anyway, I do not use PEC on my 8" LX200-ACF. Imaging satellites through a telescope is difficult but can be done. Most GOTO telescopes have the capability to automatically track a satellite as it rapidly passes overhead. However, this tracking is not very precise, usually requiring manual corrections. With a wide field of view (camera mounted at prime focus, typically), monitoring the satellite in a properly aligned finderscope is usually adequate. Using a slew speed of about 1/2° per second (key #6 on the AutoStar) is normally where I start for tracking corrections. Video recording is probably the best way to quickly capture images of the International Space Station through a telescope. If your camera has it, using a fast "burst mode" of imaging can also be used. Once you have acquired images, especially if using a digital camera (or cell phone, which is digital), you will probably need to do some image processing. The amount and specific processing needed will vary depending on the camera used, the image file format, and the object imaged. I learned a lot of image processing basics from "A Guide to Astrophotography with Digital SLR Cameras". I'll briefly discuss some of the techniques here but for a more indepth discussion, check out the book. As mentioned earlier, I prefer to shoot raw images with the D7000 DSLR as that provides me with the most control over the images. I will be discussing mostly still images here, but will touch on video recordings at the end. After an imaging session at the telescope, I import all the images onto my computer. I use Apple's Aperture software for the initial imaging processing. Aperture handles the raw file conversion automatically. (Some other applications that can be used are iPhoto, GraphicConverter, Photoshop, and Lightroom.) In Aperture, I review the images, deleting any that are not good enough for further processing, either due to really poor exposure or bad trailing. I also normally delete the focus test and framing test exposures. The remaining images are the ones that will be further processed. Moving the pointers at the bottom of the graph will adjust the dark and bright areas of the image, allowing you to bring out appropriate portions of the image. I experiment with the sliders until the image looks good. A common technique is to move the outer sliders inward until they reach the "shoulders" of the curve (where the curve touches the bottom baseline). Doing that will properly balance the image for the captured light. Further adjustments can be done to improve the image as needed. I will sometimes do levels adjustments in each of the color bands (red, green, and blue) as well. That can remove or reduce unwanted sky background color from surface lights or from a long duration exposure. Other image processing that I'll usually do include sharpness and saturation adjustments. For moon photos, I may adjust the saturation full scale, increasing it for full disk shots, decreasing for high magnification images. This will make the moon shot look better, if somewhat less natural. Once the "look" of the image is correct, I'll do any needed cropping and/or straightening of the image to best show the object. If "digital noise" is a problem, Aperture (and lots of other image processing software) can reduce it, but I find that the software "Neat Image" does the best job at noise reduction. Once image editing in Aperture is completed, I export the image in TIFF 16-bit file format and process it in Neat Image (see my linked Neat Image review for more info). The final image is last edited in GraphicConverter. I use GraphicConverter for scaling reduction for web page presentation, some additional levels adjustments, final sharpening (using Unsharp Mask), and sometimes a little final color correction. Note: many images that are posted on my Site are not the same quality as the originals. I typically reduce the JPEG compression to keep the file sizes around 100 KB or less. Using JPEG and keeping the file sizes small ensures that the images can be viewed by the most Site visitors. As you can see, the original raw image has been dramatically improved by image processing. Image processing CAN consume a lot of time, but a little can go a long ways to improving your astrophotography. Experiment with the tools you have available. I normally do not stack single frame images or frames from video recordings. When I do, I use Keith's Image Stacker or Lynkeos, both for Mac OS X. Registax and AstroStack are the two most popular image stackers for Windows. Once I stack images, I will still process them further in GraphicConverter to prepare them for posting on the web site. I hope this article has helped you understand how I do astrophotography with the equipment and software I have. The techniques mentioned will be applicable to most telescopes, cameras, and image processing software. I make no claims that my images are the best available (I know they are not), nor the best they can be (I don't normally spend hours in post-processing). But if my images and my techniques help you get started in astrophotography or improve your images, then the article is worthwhile. The size and type of your telescope and camera should not deter you from trying astrophotography. Even the small Meade ETX models can take some amazing astrophotographs with some experience, perseverance, and yes, luck. You can see examples of ETX astrophotography on the Astrophotography Gallery Archive on my ETX Site. You can see my astrophotography from Cassiopeia Observatory by clicking the "Photos" link at the top of this page.